I have just returned home after a few weeks with my parents in the beautiful South West where I spent most of my time cooking, reading, walking on the beach and playing in the garden. My parents enjoyed many coffee breaks throughout the day and I became quite the barista. Although I don’t drink coffee I enjoy the taste and smell so I put my skills to good use and whipped up these delicious morsels! 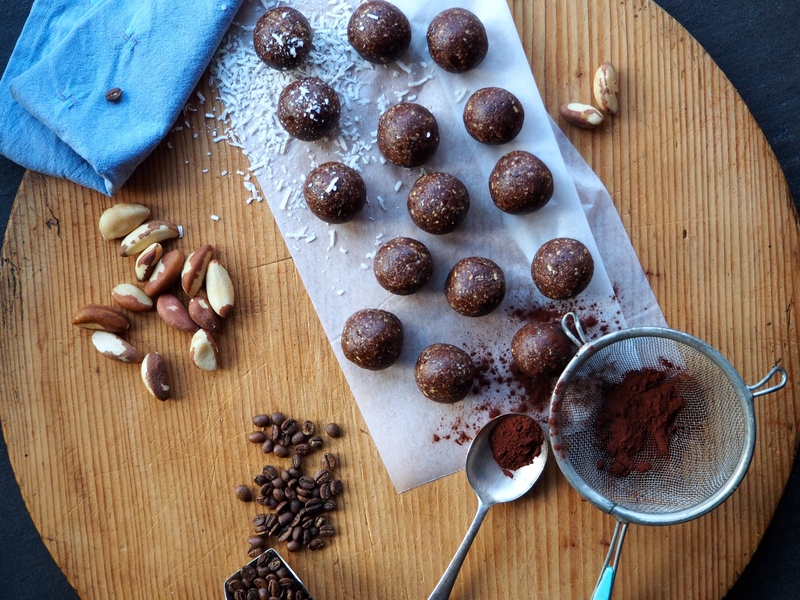 Packed full with beneficial fats and minerals such as iron, magnesium and zinc these make the perfect healthy treat. Brazil nuts can of course be substituted with a different nut but I like the flavour and oily (the good kind) texture the brazil nuts give. Maca is a root vegetable from Peru which is high in many vitamins and minerals as well as being a great energy booster. This makes these treats a REAL pick-me-up for when you’re feeling deflated, which to be honest happens to most of us during winter. Anyway, tomorrow I’m off to the sunny island of Bali to escape the winter chill and hopefully come back bursting with inspiration for new recipes. 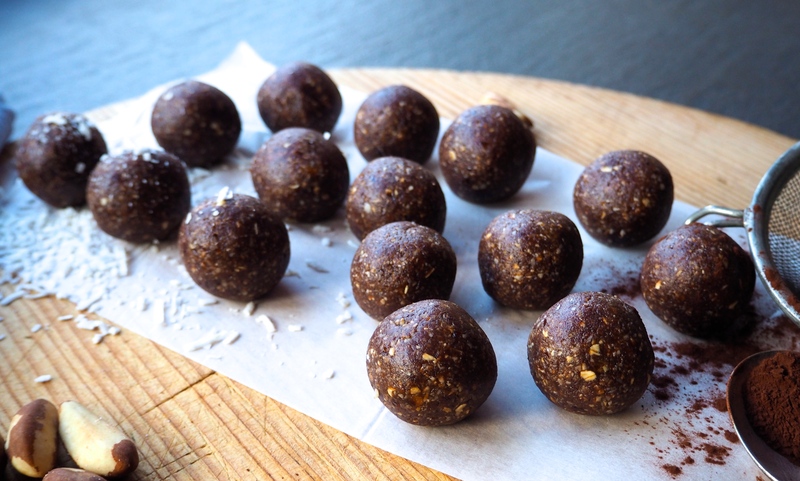 In a food processor blend the brazil nuts, desiccated coconut and rolled oats until ground. Add the cacao and cinnamon and give it another quick blitz. Then add the dates, espresso and coconut oil processing until all the ingredients come together. 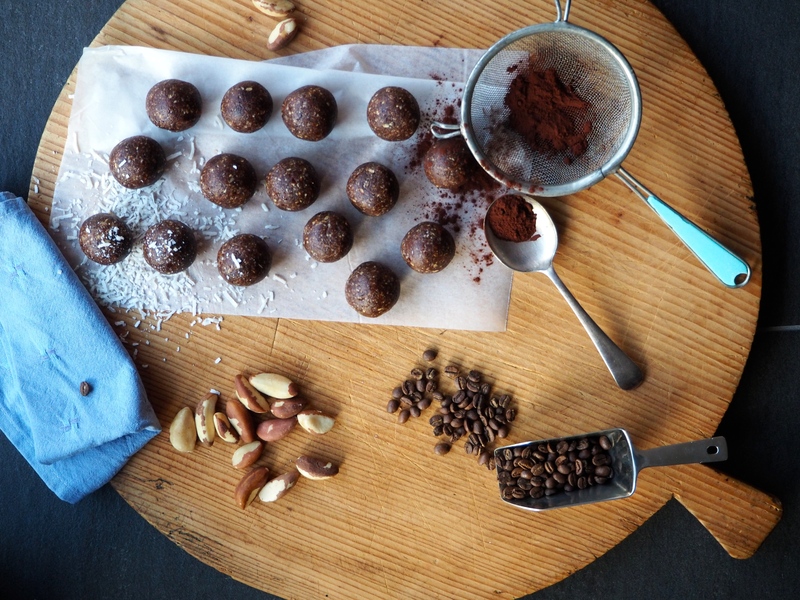 Roll heaped tablespoons of the mixture into balls and place in a tupperware lined with baking paper. Refrigerate for 2 hours before serving. Keep leftovers stored in the fridge for up to 1 week or freeze for 1 month. P.S Don’t gobble too many of these before bed time otherwise you might have a sleepless night like I did! Oh my God, these look and sound so amazing!